Wedding cake "pulls" are a wedding tradition begun in the Victorian Era. These small "good luck’" charms became a part of the wedding reception celebration and are seeing a strong revival today. In the Victorian Era, brides would collect bracelet charms, considering certain ones to herald "good luck". Sometime during the wedding celebration, each bridal attendant would receive one or more of the "pulls". Each charm had a specific meaning ~ similar to the flowers included in Victorian nosegays. For Scottish wedding some popular designs are Luckenbooths, thistles, Rampant lions, Celtic interlace designs, the symbol of eternal love or life. The charms would be strung on fancy ribbons, with a pretty bow on the end opposite the charm becoming "pulls". There are many people you could include in this part of your celebration ~ parents, other family members of both the bride and groom, best friends who may not have been in the wedding party, children attending the wedding…even as favors for your wedding guests to pull as they receive their piece of cake. Another idea would be for the groom to give the bride different charms during their engagement. This would be the giving of Fairings and Tokens, with information found at Scottish Wedding Dreams ~ Prenuptial Ceremonies and Traditions ~ Fairings and Tokens. Though not technically pulls, it would still a ‘charming’ idea. Charms for pulls run the gamut from 99 cents to over $700. They can be found in cast metal, pewter, sterling silver, gold-plate, and 14 karat gold. Some have diamonds and other precious stones. 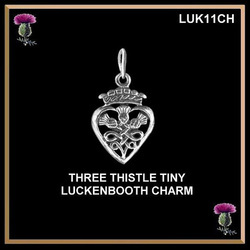 This exquisite finely detailed sterling silver small Luckenbooth is superbly made. The design is amazing given its very small size. It is only 3/4" high (19 mm) not including the jump ring and 7/16" (11 mm) wide, and includes an 18 inch chain. There are three intertwined hearts for love and a crown for Mary Queen of Scots representing loyalty. This piece is stamped .925 (sterling silver). 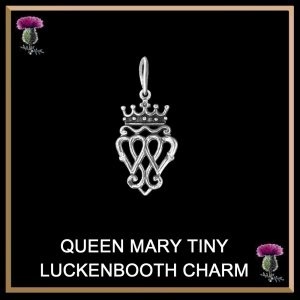 This tiny sterling silver small Luckenbooth makes a perfect Scottish Cake Pull or Wedding favor. This is a gorgeous piece of Scottish jewellery that will become your family heirloom. This exquisite finely detailed sterling silver small Luckenbooth is superbly made. The design is amazing given its very small size. This charm measures 16mm from the top of the crown (24mm from the top of the jump ring) by 13mm wide. This piece is stamped .925 (sterling silver). We also carry the matching ear rings and pendant. This fun and adorable Scottish terrier is the perfect gift for a dog lover. 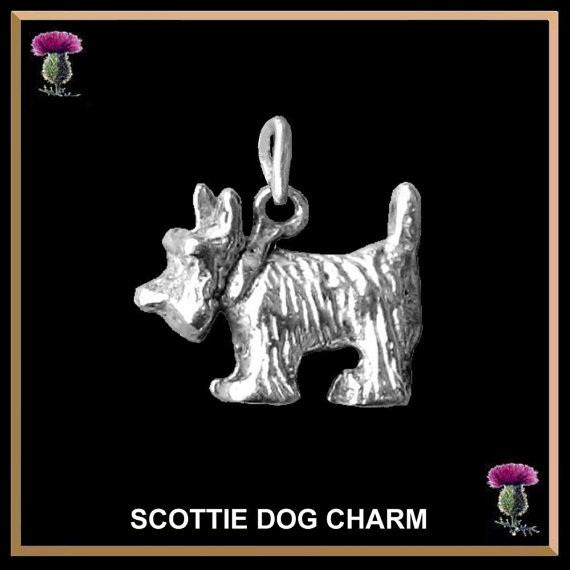 Hand crafted in great detail from sterling silver, our little Scottie measures 5/8" by 1/2" (16mm x 13mm). This is a solid two sided piece; not a hollow charm. The Scottish Terrier, popularly called the Scottie, is one of five breeds of terrier that originated in Scotland. They are a small breed of Terrier with a distinctive shape and described as territorial and feisty. Also available in a pendant and matching earrings. This darling charm is a playful accessory to any wardrobe. 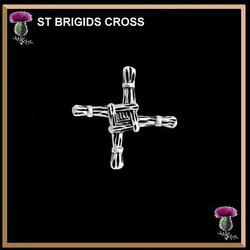 The Brigid Celtic cross is a 3/4" across by 3/4" long (20mm). It has a polished back, stamped sterling. The front of the cross is antiqued and extremely detailed. The back of the pendant has a hidden loop for a chain to easily slide a chain through. A perfect gift for a Bride to be or bridesmaids. This attractive and simple design features the Scottish thistle, the emblem of Scotland. 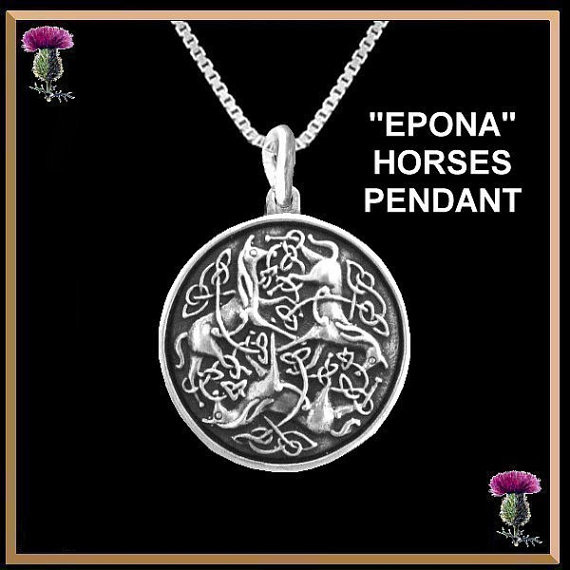 A lovely piece handcrafted from fine sterling silver, the circular thistle open work pendant measures 1/2" (12mm) in diameter and comes complete with an 18" chain. 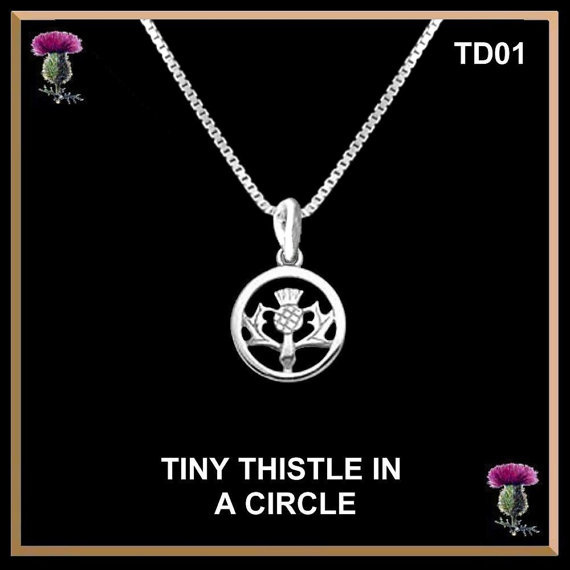 Wear alone or with the matching earrings, this thistle pendant is a great way to share in your Scottish heritage. A great gift for the younger Scot!